Well, that year happened quickly! I've had an amazing year in dance this year and I am so grateful and happy for all the amazing opportunities I have had. I've been able to work with some wonderfully talented and generous teachers and determined and dedicated students. In January I decided to completely overhaul the way I approached my dance practice. It's been a tough road but I've got a lot of work under my shimmy belt and I am really feeling the benefits. February was Valentines day, which meant preparing a special restaurant set, so I really did hit the ground running. March was an amazing month, starting with Majma, where I did all 5 workshops with the wonderful Ava Fleming. I also managed to fit in a private lesson with Ava, which was absolutely brilliant. There really is nothing like spending an intensive lesson working on exactly what you need to work on with such a great teacher. I am still working on and growing through the inspiration and practical tips from that weekend. I also got to watch Ava dance "Too Close", one of my favourite fusion pieces of hers, from right by the stage. Then there was Ashley Lopez. I was super lucky to bag a place on a low-ratio intensive weekend with Ashley. She is another brilliant teacher, both in terms of technical dance and inspiration. We did a lot of evil conditioning and some mad layering and technical geekery. We also had a really good session on creating a training schedule and a session on postural analysis, which I have applied to my own dance as well as my teaching. I also started on Alexis Southall's Tribal Fusion Education programme. This means I have been whizzing up and down the M5 on a regular basis for studio time with Alexis. There are 17 of us on the programme and it has been a blast getting to train and hang out with the other dancers, many of whom were already good friends. We've been sharing ideas and discussions and our passion for Tribal Fusion dance in general. Alexis is a fabulous teacher, she's absolutely lovely but also understands the need to challenge us to push our boundaries. I would like to steal her and bring her down here so I can train with her every day! It's been a good year for teaching too. I taught a fire dance workshop for Gina and the Bellygees on their glamping weekend, which was a great opportunity to hang out with those ladies and get to know them better. Classes in Glastonbury and Bridgewater have continued and it's been great meeting a new wave of dancers coming into these groups. Glastonbury classes start back on the 11th and Bridgwater on the 5th (first session is a Burlesque session for giggles). I've also taught a few hen parties which are always hilarious, a workshop at a large exhibition arena. I hosted my second hafla in Glastonbury, which was a great success. I was also hosting Samantha Riggs and Demelza Fox who both taught workshops. Sam stayed with me for a little while and it was lovely to get to know her. One thing I love about the bellydance world is that I am always meeting such amazing, fun people. Sam's workshop was so much fun, and it was great to see the participants on stage with her showing off their new Bhangra skills. Demelza is another lovely, fun teacher and everyone got a lot out of her stage presence workshop. I also taught a Dark Fusion workshop. I was really impressed with the ladies who took part, the worked really hard and were totally game when I suggested we perform the choreography at the hafla, after just 2 hours spent learning it! They were fabulous! We also had some great performances at the hafla in various styles. I am always impressed when people turn out and support events, but moreso when I see the calibre of performances on offer and the amount of work that clearly goes into it. I've also really enjoyed attending a whole bunch of haflas this year. It's been a crazy busy time, to the point that I sadly had to turn down invitations to events I really wanted to participate in. This performance also happened the same week as Infusion Emporium, which was a brilliant weekend of spending time with some of my best dancey people, training outside my comfort zone with Heather Stants and performing a duet with Kitty Kohl at the fabulous and hilarious Glitterball Shakedown. I'm in my midwinter downtime now, where I sort out my accounting (yawn), plan my calendar for next year and start shortlisting performance ideas and music. Next year is going to be brilliant too. I already have some performances on the cards, a show in Wells, the TFEP showcase and some haflas. There's some good learning to be done and I'm looking forward to finding out what unfolds. Whatever happens, I wish you a happy, dance filled new year. What should I wear to bellydance class. One of the most common questions asked of me by prospective new dancers joining my class is "what should I wear" so it's probably high time I wrote a blog about it. Wear something you feel comfortable moving in, and can see your movements in. Leggings or yoga pants with a vest or t shirt is fine, you can wear a shimmy belt if you like (I lend them out) bare feet or soft dance shoes are good. But there's a little more to it than that - because otherwise I wouldn't have started writing about it. I'm not going to talk about footwear though, because I've done it before. What dancers wear to class depends upon a number of factors. The style of the class and the preference of the teacher (and other students) dictates much, the dancer's approach to dance and what they are getting out of it, what the dancer feels comfortable and functional in and what stage of their dance career they are at. Some dancers like to come to class in a skirt, the right shape skirt can help emphasize hip movements and if you want to dress up a little for class a pretty skirt is a good option. I often wear a 25 yard skirt for ATS classes (wrapped and tucked) and occasionally a straight or basic fishtail skirt for Orientale classes too. The downside with skirts is that if the class involves floorwork, yoga or certain types of conditioning you might find a skirt impractical. A skirt also covers your legs and often your feet, which means your teacher can't keep an eye on your footwork. Pants could be yoga/jazz pants, harem pants, leggings or specialist bellydance pants like Melodias. I find longer pants trip me up a bit, so I tend to go for calf length, leggings or harems with elasticated hems. Really full pantaloons can be a trip hazard, but they are OK for styles that don't involve too much fancy footwork. Fitted/stretchy tops that allow the line of your body to be visible are really helpful when you are learning bellydance. Often your movements will be small to start with and they'll get lost under a voluminous t shirt or layers. A cropped layer for warmth over a normal vest top is great. You don't need to bare your midriff, in fact I don't think any of my current students do. For the ladies, I would also recommend a sports bra. Especially for saiidi and suchlike. You might get away without but holding back for "lack of support" takes some of the fun out of your class. And while we are on it, for the chaps, Google "dance belt". You are welcome. Noisy coin belts are sometimes a bone of contention. I encourage them in my classes, because my classes are small and I think the weight and auditory feedback is really useful for learners. In a large class or an echoey venue a lot of students with noisy belts and ants in their pants can be massively distracting (see Stork's sweary guide to sins in large workshops, if you are comfortable with sweary ranting). Also be aware that cheaper coin belts with stamped coins will "shed" as the sharp edges work through the thread. If this happens be sure to pick up your beads and coins before they cause injury. Hipscarves and belts also serve the important purpose of making your hip movements clearly visible. So go for a colour that stands out. If you don't like the noise you can get quieter beaded ones, or just a bright fabric scarf. I have a habit of using my neckscarf (because we are back to the bit where I dress for class like I had to buy my clothes at a charity shop 5 minutes ago). Remember that what you are wearing helps your teacher to see your dancing, so the clearer your attire is, the better feedback you will get. OK, there are probably 2 kinds of workshops, and they aren't always that clearly delineated, it's more of a sliding scale. I'm going to call them "fun" and "serious". Not because the fun ones aren't serious or the serious ones not fun, but for want of a better term. "Fun" workshops are the ones aimed at dancers who dance "just" for fun. Often they happen before a local hafla or as part of an end of term celebration. They have descriptors like "try out a fun folk dance", "suitable for all levels" and tend to be a great laugh with a bit of a party atmosphere. "Serious" workshops have descriptors that say things like "bring a yoga mat and water", they are aimed at dancers who want to be challenged and push their dance to the highest level. There are instances where a workshop will have a clear mixture of "fun" and "serious" participants, and that's just fine too. For a lower impact, party atmosphere class, you can dress up a bit if you want to. Go for the skirts and your fancy tops, add a little bling (but make sure there's nothing sharp or spiky or generally health and safety bothersome). Don't wear your performance kit, you'll likely still sweat in it, crumple it and generally shorten its lifespan. Don't wear anything that is going to affect the learning of others in the room, like enormous headdresses (yes, I've seen that) or extremely noisy costuming - shimmy belts are usually still fine although some teachers will ask you to remove them. I usually go for a quiet belt if I don't know the teacher. If you don't want to dress up, that's also fine. You can join me in the lost property bin club. If you know your workshop teacher has a thing for yoga/pilates. If they have asked you to bring a yoga mat. If the write up suggests it will be sweaty/physically challenging. If the focus is drilling or advanced technique. 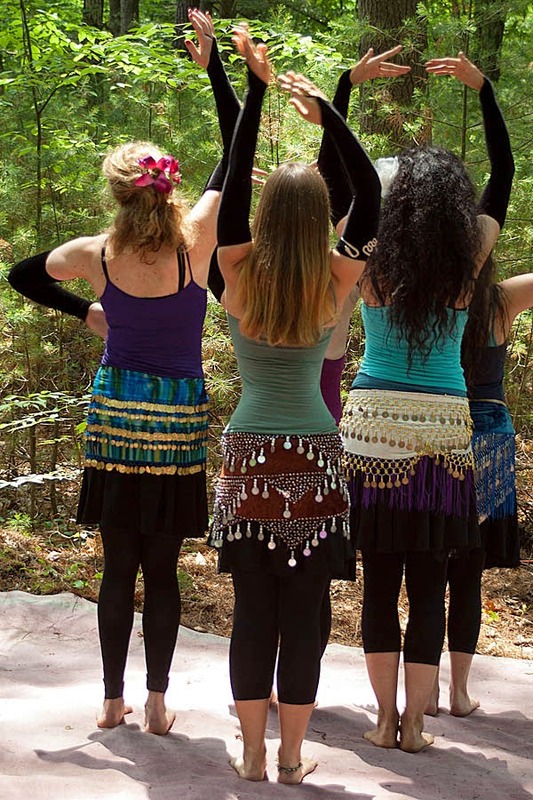 Then you need to dress for a workout/general dance class, not a bellydance party. You are wasting your time and money if you can't take part in the class because you are hampered by your outfit. Avoid long/loose pants you will trip over. Make sure you can get down on the floor, sit in a straddle etc without being restricted or flashing everyone. Go for leggings/pants and a vest, with layers, which you will need for warming up and cooling down, and a light, quiet hipscarf. If there is floorwork you are going to need kneepads, if there is spinning/turns you will likely need shoes or dancepaws. So there you go, question well and truly answered to death. I hope that takes some of the mystery/anxiety when preparing for a dance learning environment, and if in doubt, just keep it simple and functional, you will develop your own style and preferences as you go. .